But how do you know in advance whether the Bible will need that? First find the headband — or the tailband. 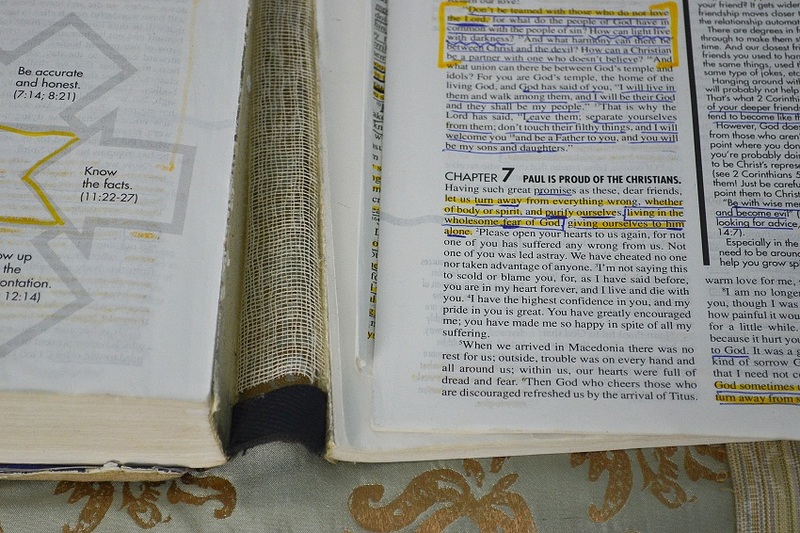 This is the small bit of striped cloth at the top or bottom of your Bible. 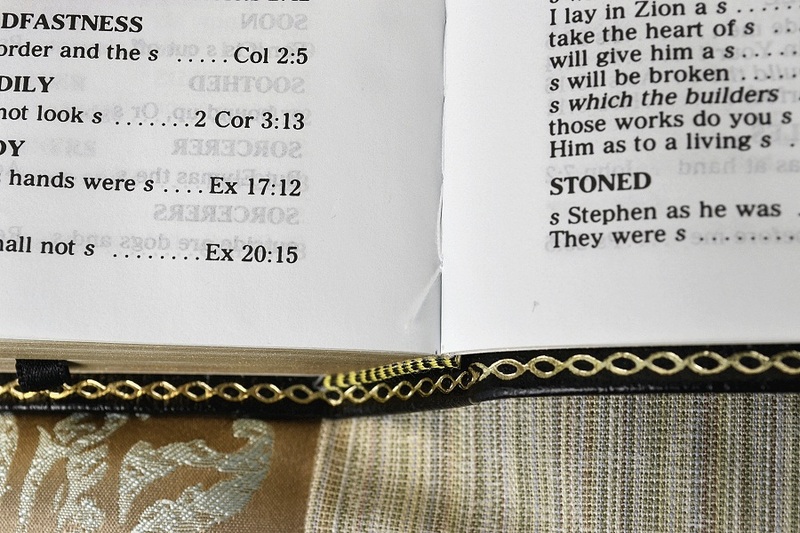 This does not show the Bible is sewn — nowadays its function is very similar to wearing a tie — it just adds a bit of color. Okay, some of them aren’t striped, either — some are solid. 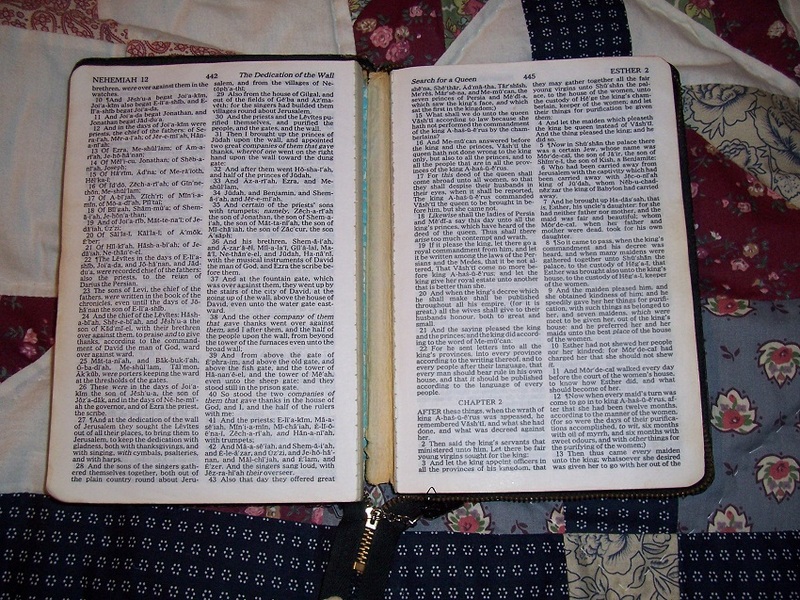 All the Bibles have them, both the sewn ones and the glued ones. 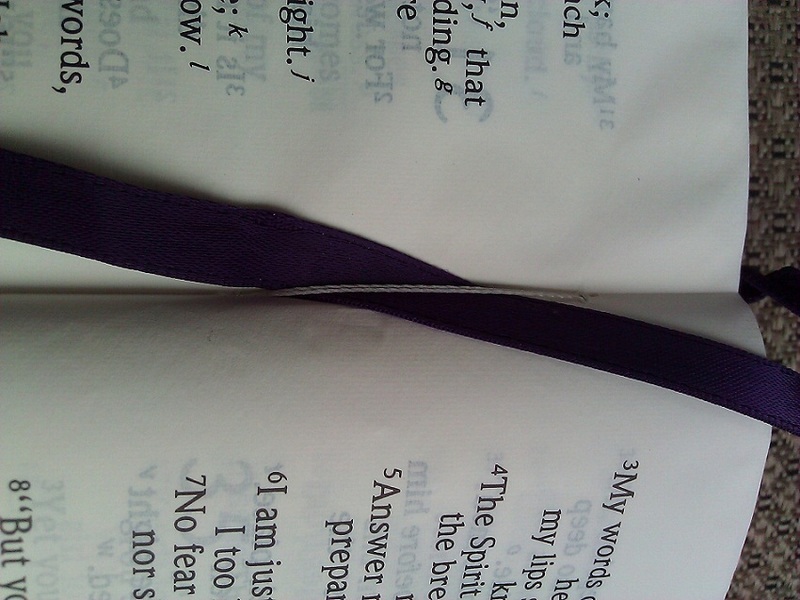 But the pages bump up against the headband and tailband and by looking here, you can (sometimes, or often, or usually) tell if the pages appear to be side-by-side in neat little folded groupings like tiny booklets. These booklets are called signatures. 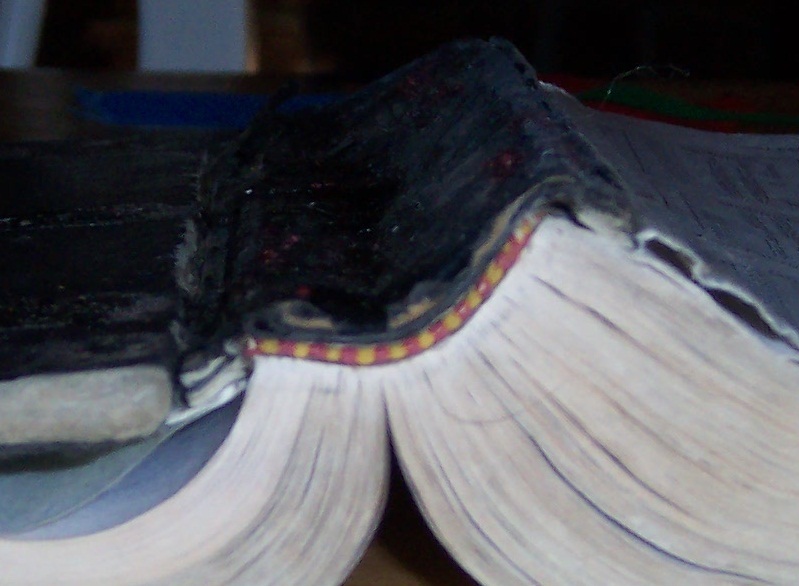 This is usually a clue that the binding is sewn. 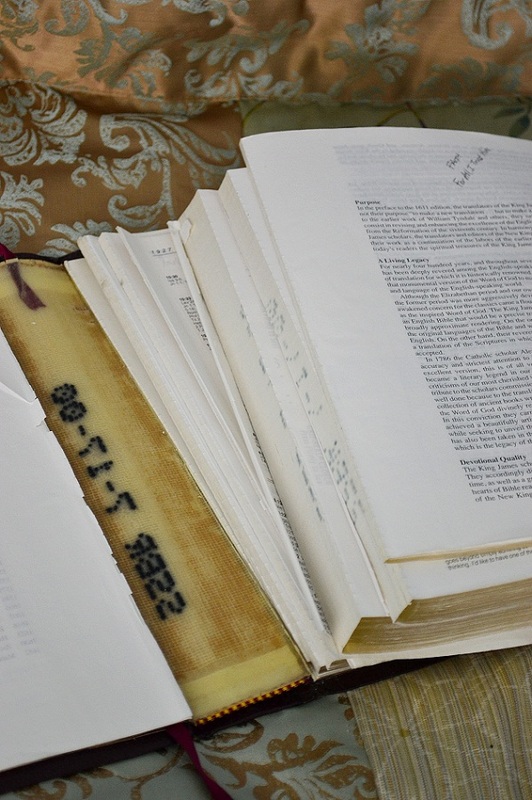 Now, if you can get to the center of one of the little signatures, look for sewing or stitching running down the length of the spine edges of the pages — in the gutter, in the center of the folded middle page. If you see threads, you have a sewn binding. Sometimes it’s easy because the sewing has become stretched and the signatures want to part company from one another. If you see threads, you have a sewn binding. 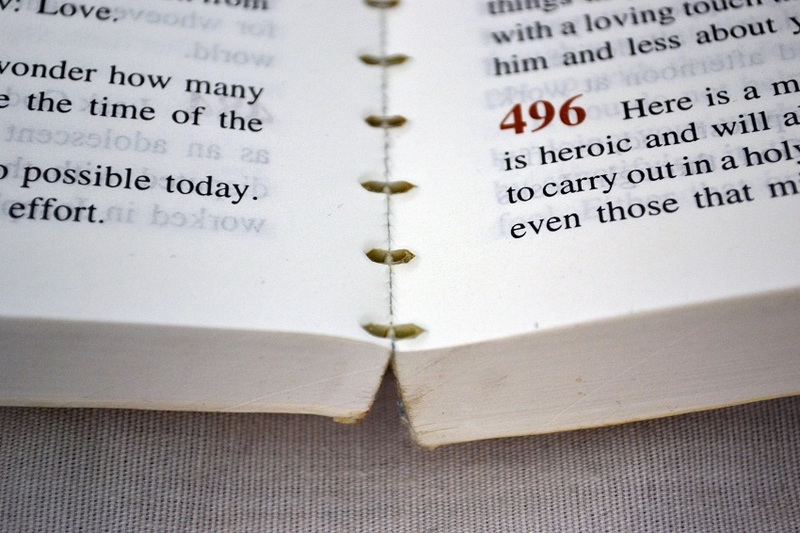 If you see small cuts along the spine edges of pages that are falling out, about 1/4″ apart, that’s not telling you your binding is sewn; in fact, it’s probably not. If you see something that looks like mesh glued down to the spine edge of your pages, that’s not sewing — it’s called hinge cloth or mull. Sometimes it’s all that’s keeping your cover from falling off. But that’s not the sewing. If you see something that looks like stitching along the spine edge of the first and last signatures, amazingly, that still doesn’t necessarily tell you you have a sewn or smyth-sewn binding. It just means the signatures were reinforced there with topstitching. In fact, sometimes that isn’t even done well, but starts popping up. 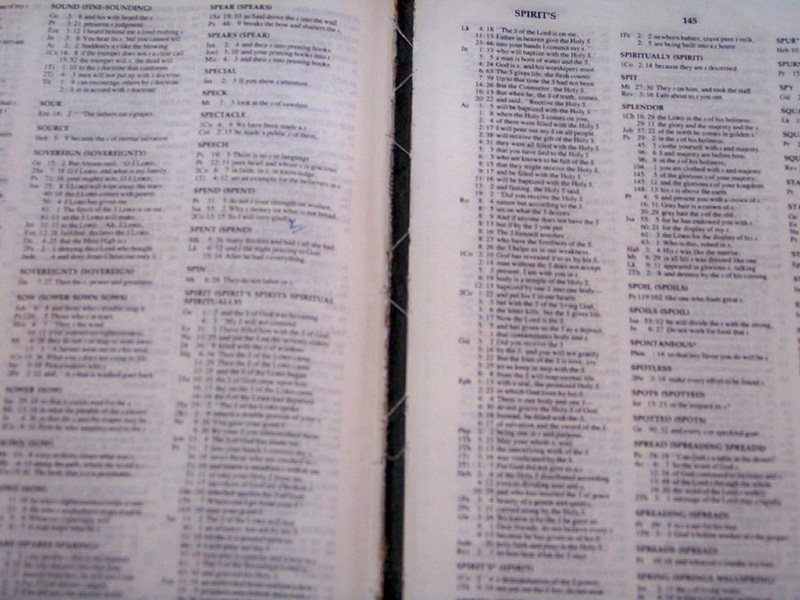 If you see signatures but cannot for the life of you find any threads in the center fold, you may be looking at a Bible with glued signatures. They are folded and they are all lined up — and then they are glued together. Sometimes there are even little cuts where you think the sewing should be — but it’s just little cuts. This one’s even worse — big cuts, very misleading. If you see signatures but the very center of each of them is stuck together, try to gently pull just one apart. Do you see threads under there? I don’t know why or how a manufacturer would want to hide the sewing, but yes, a few of them do. (Don’t try this in a bookstore!) If you see threads, you have a sewn binding.